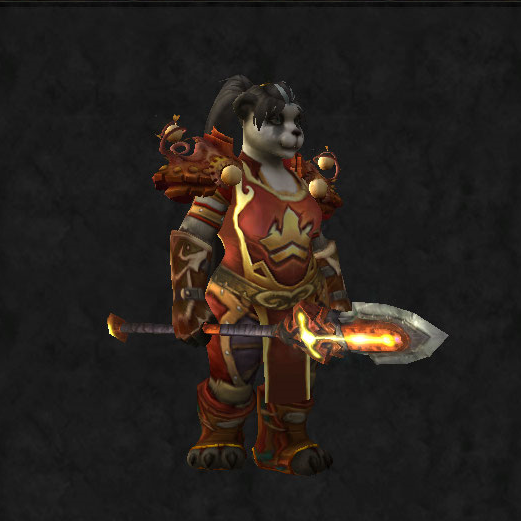 I KNOW I said I wasn’t going to transmog myself anymore… mainly because I was spending near 400g a day on it and that was stupid when I’m not actively trying to increase my gold amount. HOWEVER, I couldn’t help myself last week, and a few days ago I was complimented on it (Thanks Martin! ), so I thought I’d share it. I know the front view isn’t very clear, I got carried away with spell effects (ooh, pretty snow!) and didn’t realise. 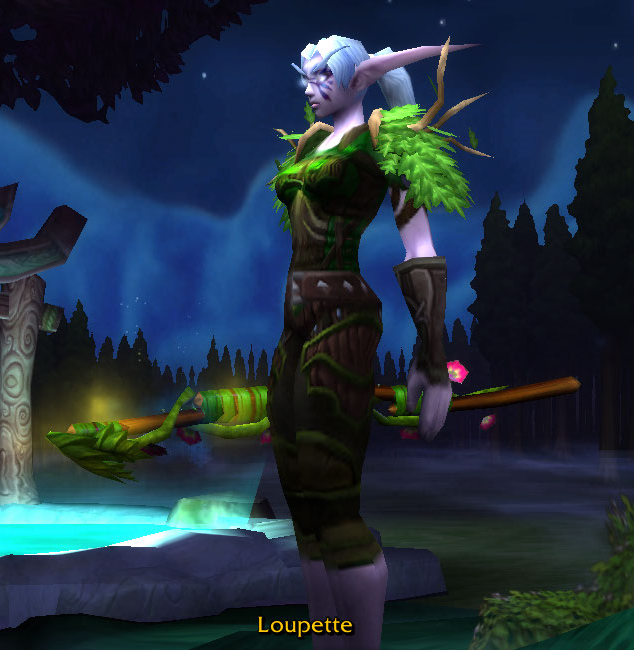 Usually the missus does the transmog posts, but my Demon Hunter mog is so awesome I’m sharing it. Here is the link to the armoury. Basically, the leather set is Bloodfang recolour with the awesome purple Artifact appearance unlocked via Class Hall quests. The shoulders are Mantle of Shadowy Embrace and belt is Crystallized Girdle. 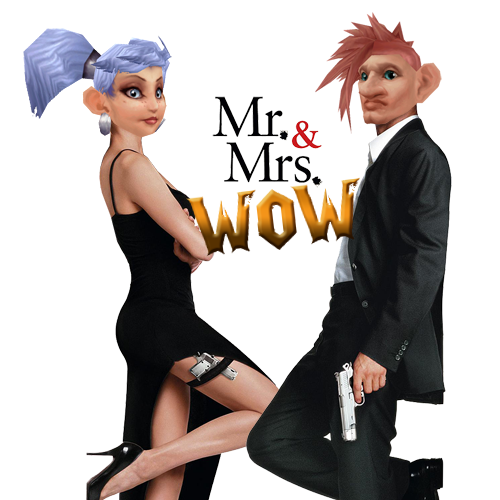 You can tell I’m pretty bored in-game by the amount of mogs I’m doing…. Here is Ari and her latest outfit. She only got a new one as her old one is a bit dark and heavy – it’s almost summer after all! This is actually a mix of the only stuff I had available to me at the time (I really couldn’t be bothered to grind anything), so I was quite happy that it all came together. 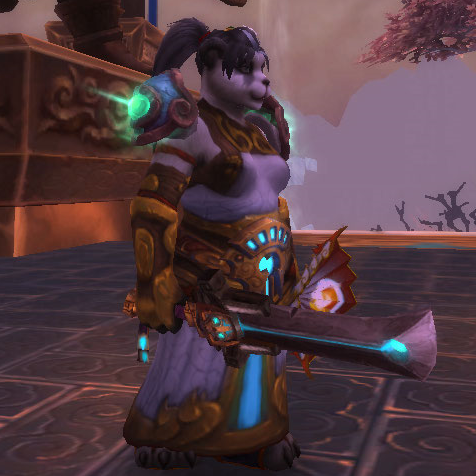 My monk has been after a new mog for a long time. She is currently Windwalker (you can see her Mistweaver set here) and doesn’t really like wearing a dress when she’s spinning and kicking. 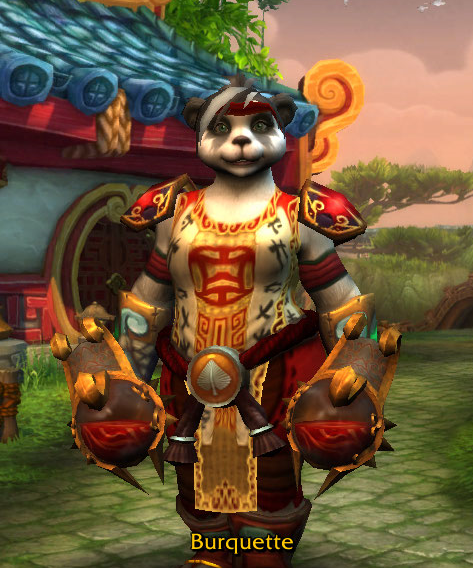 However, she’s decided that every Monk and Rogue on Doomhammer seems to be wearing this and she doesn’t want to be *that* kind of Panda. So… what to wear? But this doesn’t really match the cloak proc at all! 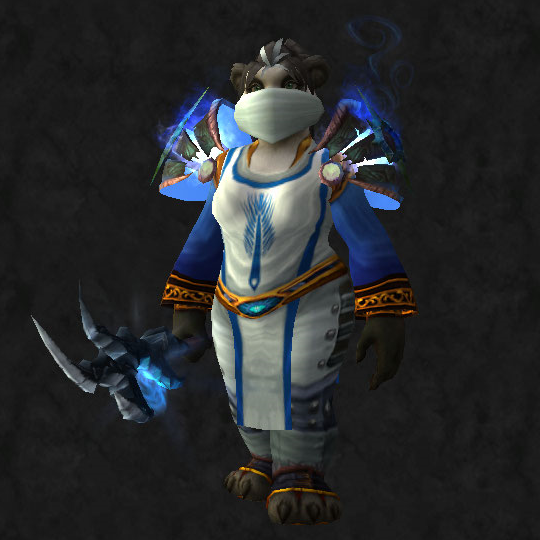 So, then she thought about this one, which uses the guild tabard which she likes a LOT. I’d really appreciate your views and suggestions, if you have any! Well hello! 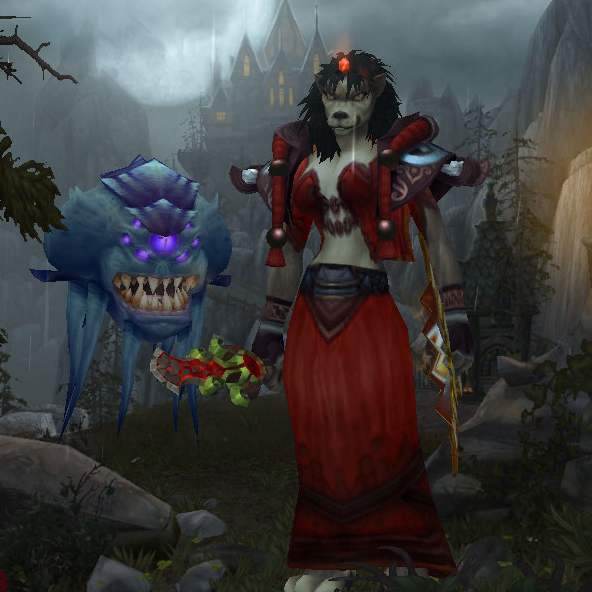 It’s been a while since I last shared a transmog, and this one even has a story to it! My Monk is currently working on the (long-lived) Legendary quest line. She’s been on it for months, but after getting it on my Mage, I swore off LFR forever. However, I recently decided to finish it off and went back into LFR… for all of 7minutes before I revolted at the 45minute queue. Naturally, I then respecced healer (of which I have NO idea) and decided that my beautifully modelled Timeless Isle brown crap looked so awful I had to change it. Of course, I had little to hand (and no intention of grinding a set for something I’ll drop ASAP), but I’m pleasantly surprised at what I put together with things I had lying around. 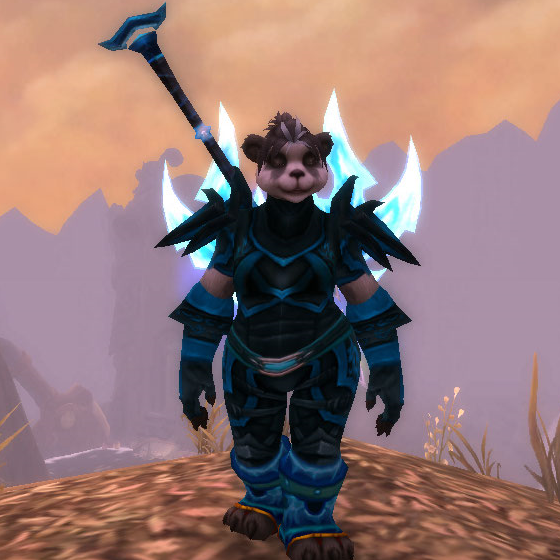 I just recently got my Druid to 90 and I love the mog so much I wanted to share it with you all. I know Druids all end up looking like trees, but this is my first Druid and I wanted to stick to their natural heritage. The staff is probably my favourite, as it grows mushrooms and flowers along its length. 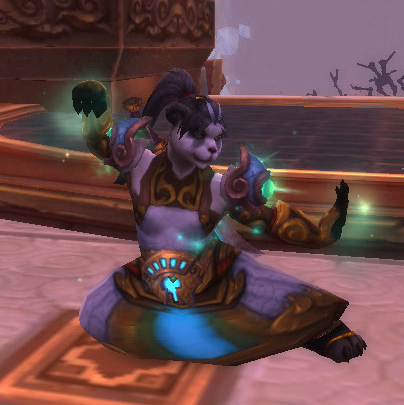 It’s really easy to get – you just do the quest for Shadowfang Keep available from the Druid trainer. It was also pretty important for her to wear trousers and not a dress, as I think anyone melée-ing (or indeed, shape shifting into a cat!) needs freedom of movement a dress doesn’t provide. I’ve had lots of suggestions to change the hair green. Unfortunately, this is just not an option… my characters all have white hair (wherever possible) and will remain to do so. I like to think it as… iconic? ?